Hula’s may build a restaurant in the Bashas’ Center. A Great Wolf Lodge is in the works for Salt River Fields. The Champions Foundation offers martial arts for children with special needs. The McDowell Mountain Ranch Homeowner’s Association chooses a new board member and approves the $1.3 million project to remake MMR’s two parks. The McDowell Sonoran Conservancy writes about Earth Day. The House Whisperer discusses how tax change laws impact our homeowners. Helene’s Team Real Estate Agent Christine Espinoza writes about flexible seating at Desert Canyon Elementary School. 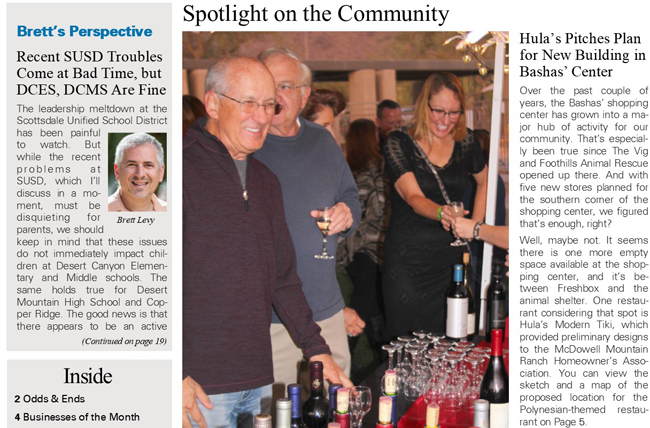 Brett Levy writes about how the latest problems of Scottsdale Unified School District impact the schools closest to home. We post our favorite photos and winners from the Wine With Friends event.